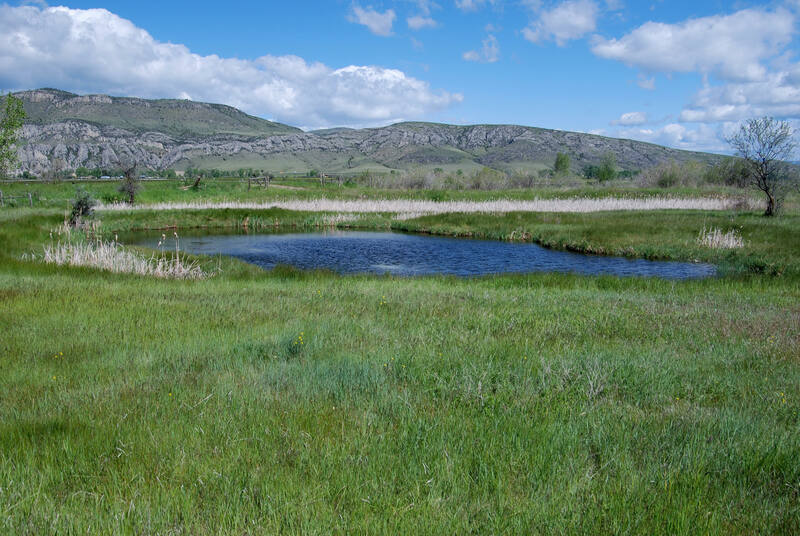 This all-deeded 357-acre Montana Ranch for sale is irrigated with senior water rights and possesses a modest but well-maintained set of improvements. Located just south of the confluence of the Missouri River Headwaters the setting provides sweeping and uninterrupted views of the Bridger, Gallatin, Madison and Spanish Peaks Mountain Ranges. The Double A Ranch affords a feeling of solitude and security in the bustling Gallatin Valley. The Ranch can be purchased in its entirety or in two individual parcels. SOLD – PARCEL ONE is comprised of about 227 deeded acres with approximately 75 acres irrigated by wheel-lines and about 70 acres under flood irrigation. The balance is sub-irrigated pasture and hay ground which has historically been grazed through the summer months. Parcel One is offered at $535,000 Cash. SOLD – PARCEL TWO, which includes the improvements, is located southeast of the Old Yellowstone Trail and contains about 130 acres. About 65 acres are flood-irrigated and the balance is sub-irrigated pasture and hay ground. Parcel Two is offered at $460,000 Cash. 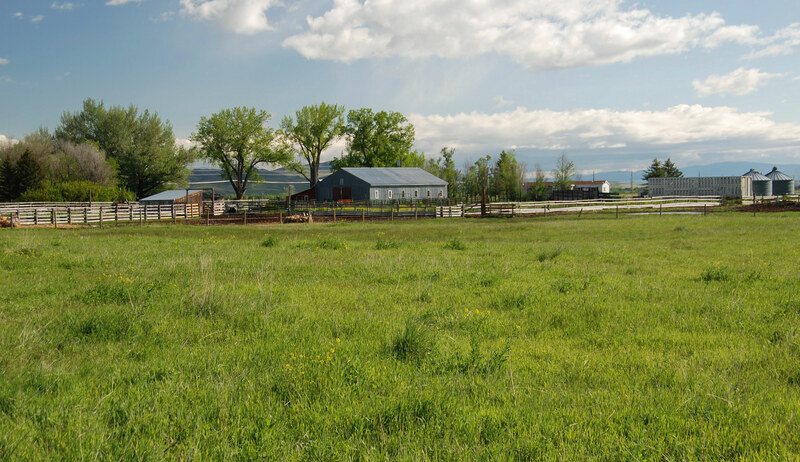 The Double A Ranch is a great opportunity to purchase a smaller turn-key operation in Montana at a very reasonable price compared to the Gallatin Valley’s relatively high land values. An easy 30-minute commute to Bozeman or Belgrade, this prime piece of Montana real estate makes the Ranch, or either of its parcels, particularly attractive to parties looking for an escape to a tranquil location and perhaps run a few saddle horses or a small herd of cattle. Corps of Discovery’s Expedition which traveled through the “Three Forks”. This all-deeded 357 acre property, offered as a whole or in two parcels is well irrigated with senior water rights and a well-maintained modest set of improvements. With tremendous and virtually uninterrupted views of the Bridger, Gallatin, Madison and Spanish Peaks Mountain Ranges, the Double A Ranch gives one a feeling of solitude and security in bustling Gallatin Valley. The Ranch is bisected by Old Yellowstone Trail, a paved county road running from Three Forks to nearby Willow Creek. The Ranch consists of two parcels; approximately 227 deeded acres lies northwest of the county road with the remaining 130 deeded acres and improvements situated southeast of the county road. Please refer to the Offering Price and Conditions of Sale on Page Eight for pricing and the enclosed map which detail this purchase option. 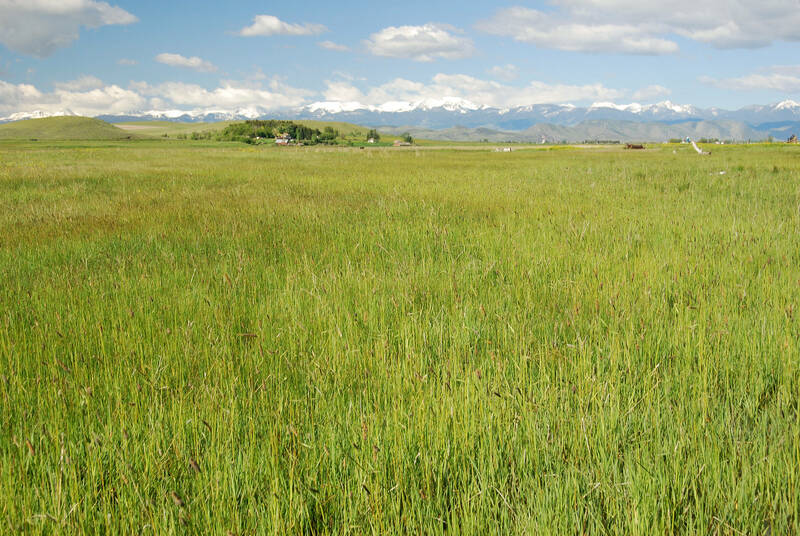 Parcel One, located northwest of Old Yellowstone Trail is comprised of about 227 deeded acres of which 75 acres are irrigated using wheel lines, approximately 70 acres are flood irrigated and the balance being sub-irrigated pasture and hay ground. This Parcel is divided into three pastures, with the wheel-line irrigated field fenced separately. 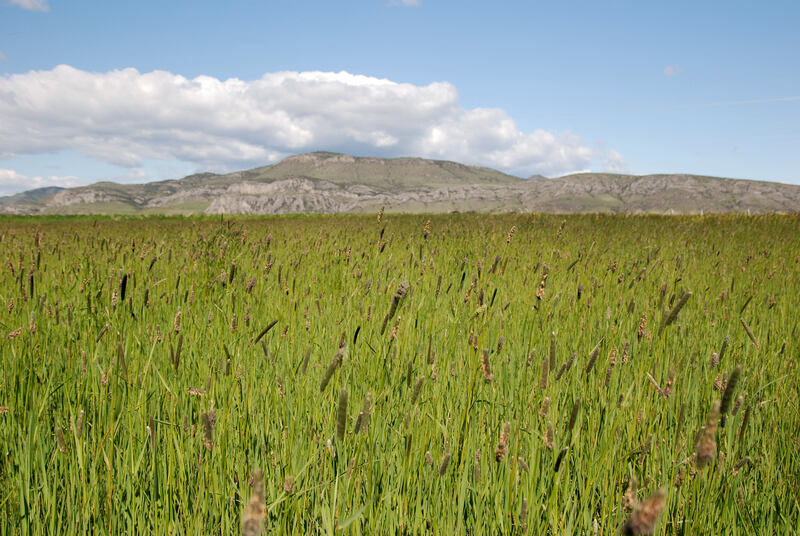 The wheel-line irrigated hay field contains a healthy stand of alfalfa mixed with brome, timothy and fescue grasses. The remaining two pastures are normally grazed through the summer months by about 25 cow-calf pairs. The Seller has historically fertilized the wheel line irrigated ground which yields about 3.0 to 3.5 tons of grass-alfalfa hay per year in two cuttings. Parcel Two, located to the southeast of Old Yellowstone Trail, contains about 130 acres of which approximately 52 acres are flood irrigated. The balance of about 78 acres is sub-irrigated pasture and hay ground. The land is divided into three pastures. The Seller has historically utilized one of these pastures as a hay meadow and grazed the remaining two pastures with cattle and horses. During the summer months, the Seller has pastured 25 to 30 cow-calf pairs on this Parcel. The improvements are located on this Parcel. A Burlington Northern Railroad spur line runs adjacent to the county road. According to the Seller, the train runs only several times in a two week period at a very slow speed. However, crossing of the tracks is required in order to access the home and improvements. The Double A Ranch is a great opportunity to purchase sizable parcels of land at very reasonable prices compared to the Gallatin Valley’s relatively high land values. An easy 30-minute commute to Bozeman or Belgrade makes the Ranch particularly attractive to parties looking for an escape to a tranquil end of the road location to perhaps run several saddle horses or a few head of cattle. 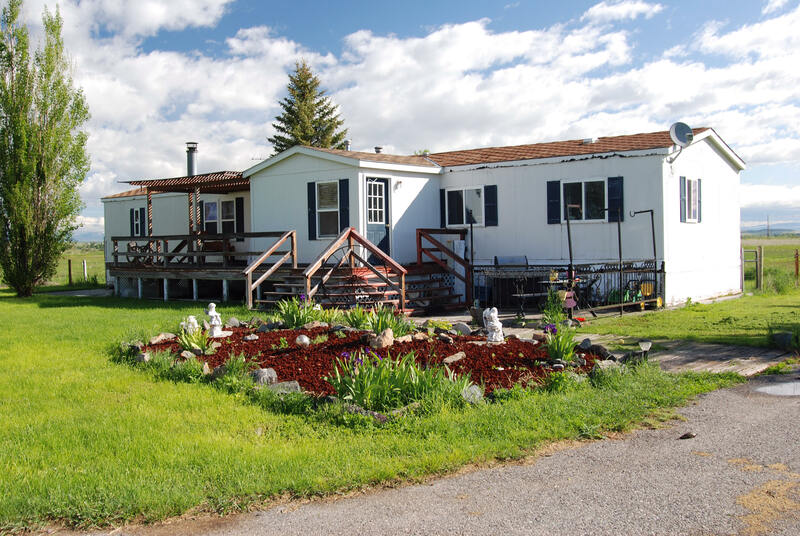 Located approximately three miles south of Three Forks and 30 miles west of Bozeman, Montana, the Double A Ranch is easily accessed off of Interstate 90 at Exit 278 then driving south on Montana Highway 2 to Old Yellowstone Trail south. The location of the Ranch allows for excellent access to Bozeman, Helena and Butte, not to mention some of the very best recreational opportunities Southwest Montana has to offer. The Missouri Headwaters State Park is located only minutes to the east where the Jefferson, Gallatin and Madison Rivers converge to form the Missouri River. The wonderful trout waters of the Jefferson, Madison, Gallatin and Missouri with their lush riparian corridors make this particular region the best in the State for fishing and bird hunting. The bountiful fishing and hunting that attracted the early trappers and settlers to the Headwaters remain an even stronger draw to today’s outdoorsmen. Good populations of mule deer, antelope and upland game birds frequent the Ranch and the surrounding areas. The “Four Rivers” contain good populations of brown and rainbow trout with numerous fishing access points provided along these rivers. River recreation in the area is virtually limitless for both walk- wade fishing and float trips. Wolves are a Class “B” school with about 150 students. Three Forks is within close proximity to a number of Montana’s fine university and college campuses, most notably Montana State University in Bozeman. Home – Built in 1959, the ranch house is about 884 square feet on one level. Consisting of one bedroom, an office area, one full bath and a small living room area, the house is heated with gas forced air and is on an individual well and septic system. A small utility room/pantry area contains the gas hot water heater, washer-dryer and Echo Water water-conditioner system. An approximately 8' x 20' screened-in porch is functional and serves as a nice space for enjoying summer evenings. The foundation is of cinderblock construction with a tin roof and appears to be in good repair. The home is in fair condition and has been relatively well maintained. The house has been used as a rental at $500.00 per month. 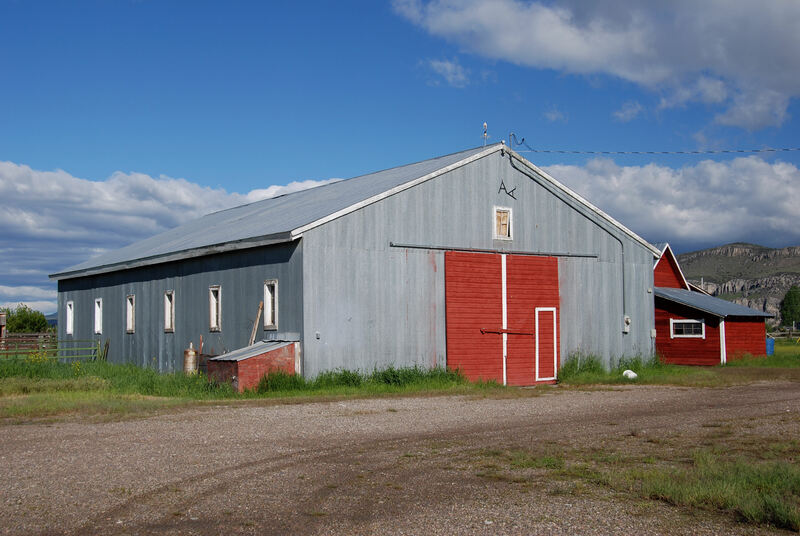 Barn-Shop – This structure is approximately 40’ x 60’ with tin siding and a tin roof and appears to be in good condition. One half of the building contains a concrete floor, three phase power and ample room to work on equipment or store machinery. The back half of the building contains four stalls which have historically been utilized for either calving or horse stalls. The stalls have dirt floors while the center of the barn is concrete and has an alley with a headcatch. During inclement weather this system has been used to work cattle. An approximately 10’ x 10’ veterinary room is also incorporated into this area of the building, complete with sink and refrigerator for storing vet supplies. Trailer House – A 1979 single-wide trailer house is also located on the Property. The trailer has a screened-in porch which was added on. The trailer is on the same well as the ranch house, but possesses a separate septic system which was installed in 2004. The trailer is in fair condition and has also been rented for $500.00 per month. Grain Bins – Two approximately 2,500-bushel grain bins are located on the property near the corrals and are in working condition. The real estate taxes for 2010 were $1934, approximately $5.40 per acre. The Seller will convey with the Ranch all of whatever mineral, oil, gas, geo-thermal, hydro-carbon and gravel rights which they actually own, subject to reservations by previous owners. They make no representation as to the quantity or quality of any mineral or other subsurface rights appurtenant to the Ranch. Electricity is provided by NorthWestern Energy and phone service provided by Qwest for the Home and Trailer House located on the 143 acre parcel. Each structure is on an independent well and septic system. Electricity is also provided along the eastern border of Parcel Two. The Double A Ranch sits at approximately 4,300 feet above sea level. The average annual precipitation is 10 to 12 inches. The area’s average growing season is approximately 120 days. The average maximum temperatures in June, July and August range from 74° F to 85° F. In December, January and February the average maximum temperatures are between 30° F and 38° F.
Summer nights average about 45° F. The winter average minimum is between 30° F and 38° F.
There is plenty of sunshine throughout the year. On May 14, 1804 Meriwether Lewis and William Clark along with thirty-three men headed west up the Missouri River to explore the Louisiana Purchase. Under the direction of President Thomas Jefferson, the Corps of Discovery’s objective was to chart this new acquisition which extended from the Mississippi River across the Rocky Mountains on to the Pacific Ocean and from the Gulf of Mexico to British North America, nearly doubling the Nation’s size. They left the Great Falls of the Missouri River in north central Montana and headed south. Clark pressed ahead of Lewis with Sacagawea, their remarkable Nez Perce guide, looking for traces of her native tribe. On July 25, 1805, Clark’s small band reached the Headwaters of the Missouri near present-day Three Forks, and two days later Lewis' contingent arrived. Gallatin, the South Fork after Secretary of State James Madison, and the West Fork to honor President Jefferson. They did so as an expression of appreciation for the support of these three visionaries in Washington D.C.
"Between these two forks, and near their conjunction with that from the southwest, is a position admirably well calculated for a fort. It is a limestone rock of an oblong form, rising from the plain perpendicularly to the height of 25 feet on three of its sides." Another classic piece of Montana history known as "Colter's Run" began in this area. Private John Colter stayed behind in Montana when the Expedition returned east in 1808. He was captured by Blackfoot Indians, stripped naked and told to run for his life. Across prickly-pear cactus and through brambles, he outran the Blackfeet and took shelter in bushes beside the Jefferson River. After a 300-mile barefoot walk east across the Bozeman Pass and down the Yellowstone River to Fort Remon at the mouth of the Bighorn River, he arrived seven days later, sunburned and naked having survived on only berries and seeds. The Three Forks area was known historically with the native Indian populations and trappers as a “Crossroads”. An area abundant in desirable fur bearing animals and big game, early trappers and Indian’s alike were attracted to the Headwaters of the Missouri River. Around the 1820s the desirable pelts and big game populations were drastically depleted because of the areas notoriety and not until the construction of the Northern Pacific Railroad in the late 1800s did the Headwaters Region begin to thrive once again. Soon after, in 1908 the town of Three Forks was established. The Double A Ranch enjoys a premier and convenient location in the Gallatin Valley – one of the Big Sky State’s more desirable locales. Situated between the towns of Three Forks and the quaint town of Willow Creek, the Ranch is positioned in a rural setting while maintaining a strong sense of community with both of these welcoming towns. The Ranch is productive and well-priced for either a gentleman rancher or an existing operator in the area seeking to expand their current operation and hay base with a well irrigated and conveniently located property. 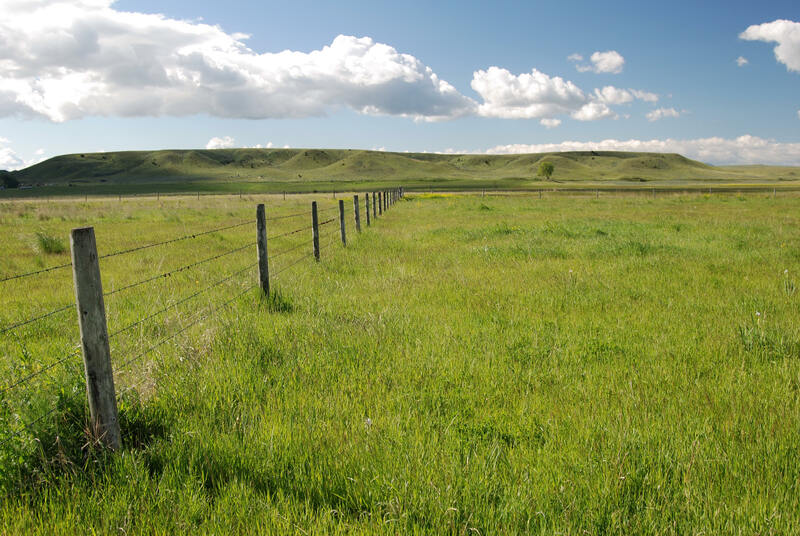 By simply utilizing the land for grazing livestock, this property provides the simplicity of ownership without many of the headaches that can come from more complex operations. The improvements are modest but in good repair and functional making the Double A Ranch a very enticing opportunity for a Buyer looking to move out of the higher priced real estate market in Bozeman or Helena and into a larger property at a lower price point with functional improvements to work with. Offered for sale to settle a family estate, the Double A Ranch has historically been a working component of one the Gallatin Valley’s storied long-line family ranches. The Seller’s preference would be to sell both parcels in one transaction; however, a prospective Buyer may purchase either parcel independently. The Seller is motivated to consummate a transaction within the year. Parcel One –Approximately 227 deeded acres of irrigated and sub-irrigated land are offered at $535,000 Cash – see the enclosed map for property division. Parcel Two –Approximately 130 deeded acres and the improvements are offered at $460,000 Cash – see the enclosed map for property division. All of the Property’s water rights will be transferred to the Purchaser and all of the mineral rights which the Seller actually owns will be conveyed to the Purchaser at Closing.